Rafa has talked today about how Newcastle United went after Matt Ritchie at the beginning of the summer transfer window, and persuaded the Bournemouth star to take a step down in the league tables in England to come to Tyneside. And Matt has been one of our best players with 15 total goals this term with 11 of those coming in the Championship – and this lad will only get better back in the Premier League under the coaching of Rafa Benitez. When the latest financial records were released to the public earlier this week Newcastle made over £40M in last summer’s transfer window, although the payments coming in for departed players like Gini Wijnaldum (£25M) and Moussa Sissoko (£30M) are generally spread over three years. But that’s still not bad at all. Rafa shows there both experience and common sense and why he is a top manager and could be very successful at Newcastle. He seems like he is busy educating Mike Ashley and Lee Charnley that not signing a player for a (measly) $2M more than they think he is worth – is just one reason Newcastle were relegated twice in nine years under Ashley. And this is in the financial context that teams in the Championship who have no parachute payments from the Premier League get only £7M from the league whatever position they finish in. By the way Newcastle are due £40M in May as a parachute payment from the PL. In the Premier League next season the mid-table team will expect to get around £140M – and they are haggling over £2M for a top player proven in the Premier League? But that’s what the club have done in the previous nine years and why we were never successful but for that one single season in 2012 when we finished in 5th place, but then we struggled against relegation the following season. Rafa will have to do the same thing this summer in the upcoming transfer window and it will not be easy, although it will be very exciting and absorbing for Newcastle fans. And we would expect Newcastle have already let it be known to some (most?) of their top transfer targets this summer that they want them to join the Rafa revolution, which has now moved back to the Premier League. Newcastle must be a big draw with Rafa in charge and Newcastle back in the big money. 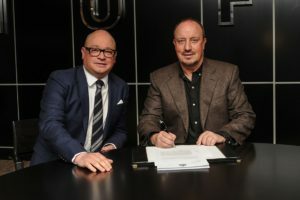 Finally, we hope the fans can see some photos of Mike Ashley and Rafa Benitez in May when Rafa has his one-on-one with the owner. Hopefully they will be smiling and maybe we can get some pictures with Lee Charnley in there too – smiling and maybe with both thumbs up? It would certainly help to show we are United at the very top and that’s so important in any organization. We need a point minimum from today’s game but I’d be concerned about our awful form. A loss and win for Huddersfield will have a serious impact on the race and will give us keegan 10 points fever. Just win today lads. Wwsbrd I think Brighton will be able to attract strikers from abroad who will have a much higher regard than Armstrong (as any prem team could). They could also take there pick from championship strikers who are much more advanced in their development than Armstrong. Just had a look at Kilmarnock website it seems Woodman is 2nd choice which is very disappointing as would have expected him to claim no1 spot. Cal Roberts is used as a sub but Sean longstaff seems to be doing ok for them. In all not very good signs. I think Arma should go to Fulham on loan, they’re a good passing side with pace who’d play the type of game Bobbybee reckons would suit him most. Still think your classing him far too highly and Brighton would take their current strikers + a couple of purchases that could be worth 15m easy over Armstrong. In an ideal world be banging them in for us. Back to today’s game I think I would play Richie behind the striker with gouff and Atsu out wide. At least he could pick the ball up and be relatively comfortable in tight spots with a great hit on him. Should consider moving training facilities near London to attract better players. Maybe offer a ground share with another North Eastern club? JFA, in my defence I’ve had a few schooners. If it easn’t for that pesky evening kick off I’d be ten minutes off a bit of festivities my self. I though I was celebrating Jesus coming back from the dead not drinking yo the poir bugger getting crucified. Jail – hmm I should read with my glasses on. I better go back and check to see if my name is on there then. I think it is a serious option in this new world of professional football. You were on there until you decended in to the gutter. Whats the point in supporting a team from Newcastle if they arent from Newcastle though? Clubs are disconnected enough from fans these days dont u think? Guys moving facilities to London when we play in Newcastle is a stupid idea and the club would become further detached from the fan base. This place will be fun tonight, if some are already on the lash! It’s all about pacing, peaking between 1945 and 2145! Will WelshPeacock9 be supporting his other prior messiah, Monkfish? I personally don’t see how where the training base has anything to do with the connection of the club to the fans, with the exception of the young lads who stand at the gates on deadline day. As hard as it is to take, lads who aren’t from the north east on the whole don’t want to live in the north east, they want to live in the big smoke. If having the clubs base in London would allow us to attract better players to the club, I’d be all for it. Only takes half hour on a flight. Wahey I’ve just discovered I’m on Ian’s approved list. I don’t know how because I’m still adamant he admitted to being Pushy Pardew even though he now denies it. I am not even from the North east and I find the suggestion of moving the club training etc to London a disgraceful one tbh. Move the training ground to London. Wtf are some people smoking on here. That is just ludicrous. Tell you what, lets rent Wembley aswell to play our home games. Please, please no more talk of Ian Toons’ list of approved bloggers – the folk on this list must be traumatised enough and wondering how the hell they were nominated in the first place and as a consequence of being nominated will be wondering if they have a future on the blog. I will be prepared to offer counseling services to any of those so affected. Other bloggers will now be unnecessarily anxious in case he does another list. Must be akin to getting a Christmas card from the Yorkshire Ripper. Ww, i havent missed the point re arma at all. Its quite simple, if we stay down rafa will go and i bet the next mgr will like him. If we go up, why will he be suitable to us. So he will be loaned again…..at what stage will rafa want him to be number 1 choice in a 4231? We had people here at start of season saying he was ready to contribute at this level. Sadly that was never likely despite the noise. Haha, we used to have training facilities in Durham during the Keegan years. The club was more together then,than it ever has been. Woodman has played every minute since he’s been at Kilmarnock, and he’s not conceded too many either, which is impressive as they were near the bottom when he took over. But I agree our youth prospects look bleaker than ever. I put this down to Ashley & Pardew’s decision to ony focus on north east talent a few years ago. Not to mention we’ve never actually seen a young player improve since Fraser Forster. I adopted the strategy of not reading Ian Toon’s posts!! That’s fair, everyone is entitled to their opinion. However at the minute there is only dummet and colback who are actually from newcastle. Truthfully, if they’d built a training complex in or around London last summer, and nothing was reported about it, would you have noticed a difference? Doesnt matter how many local lads are in the team it matters that the team is from Newcastle…otherwise why not support Man City?